There’s no wrong age to get into Astronomy (not to be confused with Astrology). People from all walks of life can enjoy looking at the stars no matter their age or skill level. Companies like Celestron, Meade, and Vixen have dedicated themselves to producing telescopes accessible to all. What may be classified as an advanced telescope because of its price can usuall y be understood quickly, now that technologies such as WiFi and hands-free controls are being implemented. You don’t need the fanciest or most expensive telescope to see the planets in our solar system. However to see further into space, where some of nature’s masterpieces lie, more sophisticated optics will be needed. If you’re a bit clueless as to handle a telescope in general, check out our guide to handling telescopes for beginners. Your first step towards a successful, continuous experience with astronomy is to scout the area around you for a good place to set up a telescope. Keep in mind that densely populated areas such as cities will have a lot of light pollution. Light pollution is the accumulation of all the light generated in a particular field. For example, a city will have street lights, cars, buildings, and various other generators that will interfere with the light given off celestial objects and a telescope’s ability to see them. Our recommendation will always be the suburbs or in an open field, away from large sources of light. If you do decide to go off-trail and away from solid ground, make sure your telescope is equipped with adequate power and stability. Chances are you’ll probably take a trip away from your home to get a good view of the night sky. What do I want to be able to see? What constitutes a beginner’s telescope? 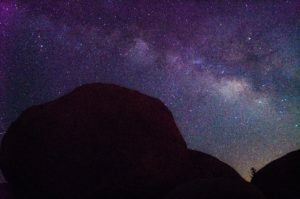 A further note on this subject—if you prefer using DSLR cameras for astrophotography, check out our list of best DSLR cameras for astrophotography. What you shouldn’t do is buy the first fancy looking telescope you see on the internet. If the option is available to you, head into an optics store or dedicated telescope merchant to see and handle telescopes for yourselves and possibly hear from experts. Head on over to our list of best telescopes to check out the ones we think you should be interested in. Most versions of telescopes have interchangeable optics such as eyepieces, which will keep your wallet safe from having to purchase another telescope if something happens to your optics. However, the lenses are directly proportional to the primary tube. If you want to buy a bigger or smaller tube of the same version of the telescope, make sure your parts can all fit together! You can look up into the sky each night for the rest of your life and always find something new. The companies that sell telescopes will usually, but not always, include a star map or database full of celestial objects. These will be of great help to you if you desire to look at a particular planet or distant nebula. It can be difficult to understand or read star maps at first, but one thing you can do is point out a familiar constellation. Asterisms (minor aspects of constellations) such as the Big Dipper and Orion’s belt are some of the easiest to see with the naked eye, so it would be a good idea to use those sets of stars as a foundation for viewing other, harder to find objects. Great! Now that you’ve purchased your telescope, you’re just about ready to see the stars. Most telescopes nowadays are becoming increasingly user and assembly friendly. That’s not saying that all of them are going to be easy to deal with, but the precedent remains that you should take great care with handling your new telescope. Handle the optics (eyepieces, lenses) with care. A stray fingerprint or scratch will ruin your view! Don’t apply too much pressure when mounting the primary tube on the tripod or the mount. Most telescopes are designed for flexibility, not durability. If you’re telescope runs on a battery, make a note to give it fresh batteries (if they are interchangeable). If it runs on a rechargeable battery, ensure that it is charged and ready for each excursion. Congratulations! You’ve set up your telescope, powered it up, and it is now ready for the next nightfall. Wait for a clear night, preferably during the spring or summer when the skies are mostly clear. You can’t do much which thick, nighttime cloud cover. Bring all your spare eyepieces with you. Eyepieces give you magnification, and no object is going to be in the same position each night. Distances and light spectrums shift all the time, and even the slightest of differences can leave you scratching your head wondering where Jupiter went.